- "C.A.P has been C.A.P since 1995, when Pouppee Fabrikk was as most active with using guitars. Since I couldn't play guitar I wanted to continue doing hard electronic music and developing the style some. In 1999 I met Christian and in 2000 I asked him to join C.A.P." You are outbreaks from Pouppee Fabrikk, what do you think is the big difference between C.A.P and Pouppee Fabrikk? - "Outbreaks is not perhaps the right word. C.A.P is its own band with totally different goals than what Pouppee Fabrikk has. The difference between C.A.P and Pouppee Fabrikk is best described with the words from a critic; Pouppee Fabrikk did music in 180 while C.A.P drives in the legal 90." Is Pouppee Fabrikk still active and are you still active in Pouppee Fabrikk? 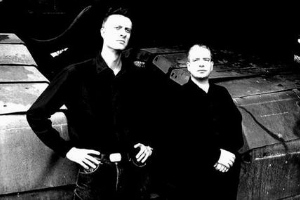 - "Pouppee Fabrikk is still active, but the band has only two members now (Leif and Jonas) because Henrik and Jouni quit. We want to start with new material but when it comes out and how it will sound we don't know now. What we do know is that it will be heavy as hell." Will C.A.P be on tour in the near future? - "After we released 'Statement' we put down more energy on making new tracks than to work on the live set so that part has been delayed. It's on the way and later this year we will play out." How would you describe your debut album 'Statement'? - "It should sound a little old school, but with a new attitude." You have done remixes of material from Run Level Zero and Ionic Vision. Do you have any more remixes on the way? - "I have got a request from Solitude FX on a remix and that will probably be the last I do for a long time." You are on the record company "Life Is Painful Records" which is a German record company; does that mean that you first are released in Germany? - "The point was that Pouppee Fabrikk should have signed the company but it never happened. And then I promised Dirk that he would get to sign C.A.P if the tracks held the measure so that CAP should end up on a German company was planned. Germany is the biggest market for EBM also, so it's good to be on a German company then." You have been getting many good reviews from a lot of magazines, both in Sweden and in Germany; did you expect this kind of good critic? - "Absolutely not, I was so surprised and very happy actually, with this album it has been over all very good reviews which I find unusual for this thin music style. I hope this brings something new to the music scene. With the thought of how big the future pop genre is we were probably a little prepared to get other reviews so we are happy we didn't have to see that." What do you think of the Swedish scene today? Is it anything good or is it just a big mess? - "The Swedish alternative scene holds a pretty high international standard. The Swedes are well seen. Good things: something I never listened to before is Covenant, their latest album is full of good tracks, then there is Run Level Zero, Dupont, Phrank and others." ...we are not sure we understand the general concept about dogs. We gather it's an odd species that tends to go "woof" a lot.